Stars: Keir Dullea, Gary Lockwood, William Sylvester, Daniel Richter, Leonard Rossiter, Douglas Rain. A masterpiece or a grim failure? Critics couldn’t agree, but Kubrick’s exploration of nearly every popular sci-fi theme has since become firmly rooted in our cultural landscape. A fail-safe device long popular with the science fictionist perplexed to terminate his galactic voyage is the time warp–a concept whereby, under conditions of extreme distance or speed, sequential experience is alleged to fracture and permit simultaneous existence in discontinuous segments of chronology. Thus a voyager somewhere beyond alpha Centauri may discover that he has become his own son or his own grandfather, as the case may be. Since this phenomenon, like the related anomaly of extra-dimensional space, is not only inexplicable but incomprehensible to the linear thought processes of contemporary man, it allows the novelist to exit in a display of pyrotechnic mysticism. But it is done at the cost of raising in the reader a suspicion that the narrative carpet has been snatched from under him: the most resourceful practitioners avoid it. I was sorry, then, that the sole surviving argonaut of the Stanley Kubrick-Arthur C. Clarke 2001 found himself at journey’s end in a Directoire motel bedroom, hob-nobbing with himself at several ages, including the yet unborn. This personal redundancy was preceded by passages of considerable length in which the lights of Broadway appeared to have been reduced to a jet stream by mirrors in parallel and the substance of the color film itself seemed to melt into spirals of fuming infinity. Neither effect is unknown to experimental film makers of the past twenty years. The ambiguity of these closing scenes is the more disappointing because at least twice in its progress this most ambitious and often most thrilling of space films promises some energy of communication. First, a segment of the picture that precedes the planetary departure from the moon introduces some sardonic comment on the transfer of middle-class sentimentality, affluent comfort and the CIA mentality to orbit. 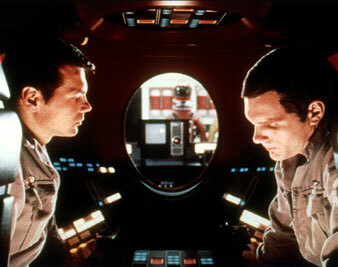 Then, once deep space itself is invaded, it becomes apparent that a conflict is brewing between the two human astronauts and the computer that operates the ship and is known as Hal. Here the picture shows signs of shifting over from social criticism to melodrama–the natural habitat of science fiction. Hal, we are told, may have had “feelings” programmed into its circuits, the better to communicate with its flesh and blood lieutenants. It soon develops that the computer, which talks in a voice suggesting a too great attachment to its mother, is motivated primarily by feelings of paranoia. Disaster, of course, follows, but the plot does not. We are left to confuse ourselves with the semantic dilemma of whether or not a sufficiently sophisticated “electronic brain” could develop an identity. Some independence of operation can be built into computers and man may thus in time condition himself to assume their autonomy, but if Hal was indeed a homicidal psychotic it was because someone back there had coded the mania into its transistor. Some promising suspects were to be seen tramping about the moon in their snappy space suits, but we shall never know–the threads are all lost in fog and the flouting of Aristotle and Euclid. I prefer that thrillers should unmask the villain. Finally, the mock-ups of astronomy and space technology are beautiful (the great rotating wheel of the way station between earth and moon is magnificent) and the expediencies of weightlessness are amusing. A great deal of skill and ingenuity went into this amazing voyage to nowhere.